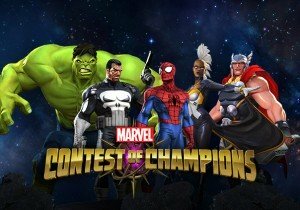 Kabam is proud to announce the new monthly Marvel Comic series, Marvel Contest of Champions, inspired by Kabam’s popular Marvel Contest of Champions mobile game. This marks the first time Marvel has produced an on-going comic book series inspired by a video game. Marvel Contest of Champions issue number one is available at local comic shop retailers and digitally through the Marvel Digital Comics Shop. Marvel Contest of Champions comic writer Al Ewing and Kabam artist Gabriel Frizzera will be available for autographs at Marvel’s New York Comic Con booth on Friday, October 9 at 10 a.m. The Marvel Contest of Champions comic series will focus on popular Marvel Super Heroes that are featured in the mobile game, including Iron Man and Gamora. In addition, the comic will introduce new characters to the Marvel Universe that are also debuting in the Marvel Contest of Champions mobile game. For the comic’s debut issue, Kabam and Marvel collaborated on the development of a new character, Guillotine, a Super Hero who wields a powerful magic sword that’s been passed down through her family since the French Revolution. New York Comic Con attendees will be among the first to see her in action as well as fan-favorites Venom and Joe-Fixit, who are both appearing in the comic series and making their in-game debuts in October, at the Marvel Contest of Champions demo stations at Marvel’s booth. Marvel Contest of Champions is the only arcade-style fighting mobile game that dives deep into the Marvel Universe. Heroes and villains from Marvel’s Avengers: Age of Ultron, Avengers, Thunderbolts, X-Men, Inhumans, Guardians of the Galaxy and more battle it out in iconic Marvel locations, in an epic storyline that stays true to classic Marvel storytelling. The game launched in December 2014 and surpassed $100 million in gross revenue in seven months, the fastest any Kabam game has hit that revenue milestone. To download a digital copy of the Marvel Contest of Champions comic book, please visit Marvel’s Digital Comics Shop.